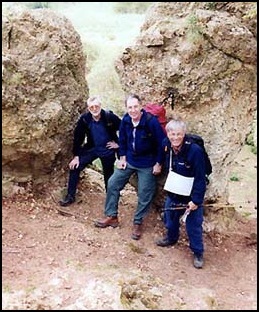 In February 2002 Larry, Mick and I walked on Bredon Hill, which we thoroughly enjoyed. Click here to see the report. Peter, unfortunately could not make it that day. 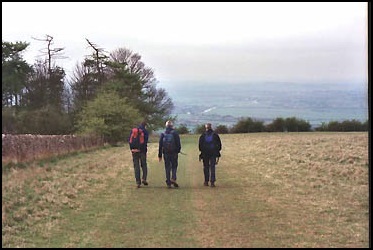 However, he was keen to visit this area, and we were keen to go up Bredon again, so shortly after 8.00 a.m. on the 14th May saw the four of us travelling to Ashton under Hill, located to the south east of the "Hill". 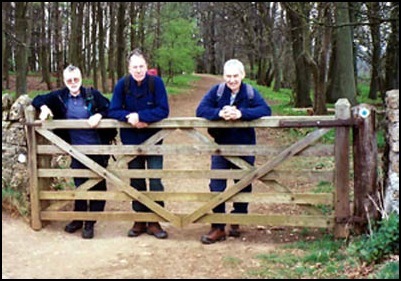 However, before reaching Ashton, and the start of our walk, we made a brief stop on the Evesham By-pass to partake of breakfast. We had decided to get the walk over with before having a meal and Larry was therefore keen that we should not suffer hunger pains if we had a late lunch. We didn’t like to disagree so breakfast muffins it was. Having found a suitable parking spot in the village of Ashton we got our rucksacks and boots on ready for the off. It was then that a dog visited us. Mick and Larry made a fuss of him - or was it a her - and we were on our way. Although the dog stayed with us for a few yards it soon vanished, which pleased us, as we did not fancy having it follow us over the hill. A few minutes later, while we were still in the village, a large car came up behind us, slowed down and stopped. The driver, a woman, opened her window and spoke to Larry, who was the nearest to the vehicle. We all assumed she had read Brilwalks and wanted to get acquainted with Larry so we carried on. A minute or so later Larry caught up with us and related their conversation. I was amazed at what he said. It seems that the woman had lost her dog. She asked Larry if he had seen one. When he said he had she chastised him for "not returning it to the Farm". It would seem that in this area of the country if you allow your dog to "escape" it is the responsibility of anyone who comes across it to stop whatever they are doing, catch the dog, find out where it came from and return it to the owner. And if you don’t you get "told off". No wonder the dog wanted to get away if this was its owner’s attitude. Anyway I digress. Let’s get on with the walk. Rather than go straight on to the "Hill" we had agreed to take a trail that started slightly north of the "straight up" route. Initially the path was quite steep but leveled out halfway up the hill and then we more or less followed the same contour line heading northwestwards towards the earth works located to the south of Elmley Castle at grid ref 979402. 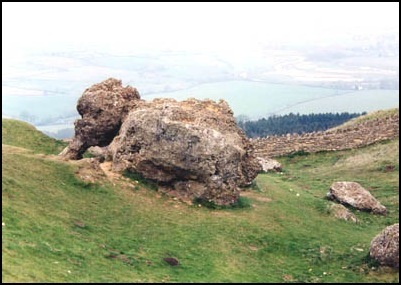 These earth works, which I presume was the site of the original Elmley Castle, were massive and we spent 15 minutes or so wandering around them and admiring the views before finding a route to take us to the main east west path across Bredon Hill. This was the hard part done and we followed the path, with good views to the north, along to the Tower on top of the "Hill" and Banbury Stone, which looks like an elephant. Although we had sweated getting up Bredon it was now decidedly chilly and we sheltered in the lee of the tower and passed the time of day with a mountain biker who had cycled up from Tewksbury. Once out from behind the protection of the tower, which is more or less the highest point on Bredon, it really was cool so we decided to go downhill a.s.a.p. Which we did, shortly followed by the cyclist who like us was going southeast. This was a very pleasant part of the walk particularly as it was now mostly downhill. The wind became less noticeable, the sunshine improved and the path took us through pleasant wooded areas with spring vegetation coming to life. This stretch of the walk gave us good views over the village of Bredon’s Norton and towards Tewksbury, the M5 and Ross Spur. Soon we came to the King and Queen Stones. The cyclist, who we met earlier, had told us that legend has it that if you walk between the two stones you will immediately be cured of any illness that you have. 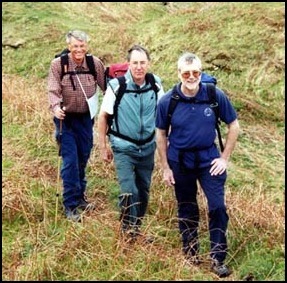 Needless to say, because I am known to complain about odd aches and pains, particularly in my knees, hence my use of walking poles, the other three thought I should see if the legend would work on me. And in testing the legend I almost broke my neck, as the stones are half way down a very precarious slope. Soon after this we stopped for a snack and drink before continuing downhill to Kemerton. Although weather forecasts a few days previously had stated we could have some rain they really had got it wrong. The sun was still shining and the temperature was increasing. What we needed was a drink and in Kemerton we found a suitable hostelry to meet our needs. The food here looked nice too, but as we had decided to go back to Ashton under Hill via another visit to the top of Bredon Hill we considered that a meal at this point might not be helpful in undertaking the afternoons exertions. Mick was quite amazed that I accepted the idea of tramping up hill again so easily, particularly as the King and Queen Stones had not improved the knees. We followed the road to Overbury and then took the left-hand path of the two that go through Overbury Park on the way to Lalu Farm and the top of the hill. This part of the walk was not as bad as I had expected. Bredon Hill is a convex slope from this direction so once we had got through Overbury Park the slope became less steep. However, the sun was really doing its stuff and we all welcomed a stop before Lalu Farm to have a snack and a drink of water. Lalu Farm behind us, we soon reached the east west path over the "Hill", part of which we had used earlier in the day. So we turned right onto it and followed it all the way down to Ashton under Hill passing through a couple of very nice private gardens and the church yard on the way. We reckoned we had done about 10 miles, so it was a relief to sit down in the village and get our boots off and hope that we weren’t accosted by some ill mannered farmer’s wife who may have lost her dog. The next stop was pub and food. But at half past three in the afternoon very few pubs are open and most of the ones that are have told their cooks to go home. The pub at Kemerton that we had visited earlier in the day was closed, as were all the hostelries at Bredon, Eckington, Pershore and in the centre of Evesham. However, I had remembered one on the Evesham By-pass that was open all day. And although the beer may have not been what the connoisseurs like Mick and Larry preferred it was very acceptable as was the steak and chips. The map we used for this walk was the O.S. Landranger No. 150 which covers Worcester, the Malverns and surrounding area. However, as this is only 1:50 000 scale the O.S. Explorer for the area, No. 190, would be a better map to use.